YHRF » Our sixth Yule….. The Jimmy Cake, Dáíthí, David O’Doherty, John Banville, Thom Brookes, Jetsetter, DOTT, Toby Kaar, ANDERSON, Dónal Lunny, The Spook of the Thirteenth Lock, Fred Cooke, Glimmermen, and some surprise guests. And we will have DJ sets from; DJ Scope (ChoiceCuts), Peter Toomey, The G-Man, Joss Moorkens vs. YHRF, and Niall McCormack vs. Daragh O’Halloran. 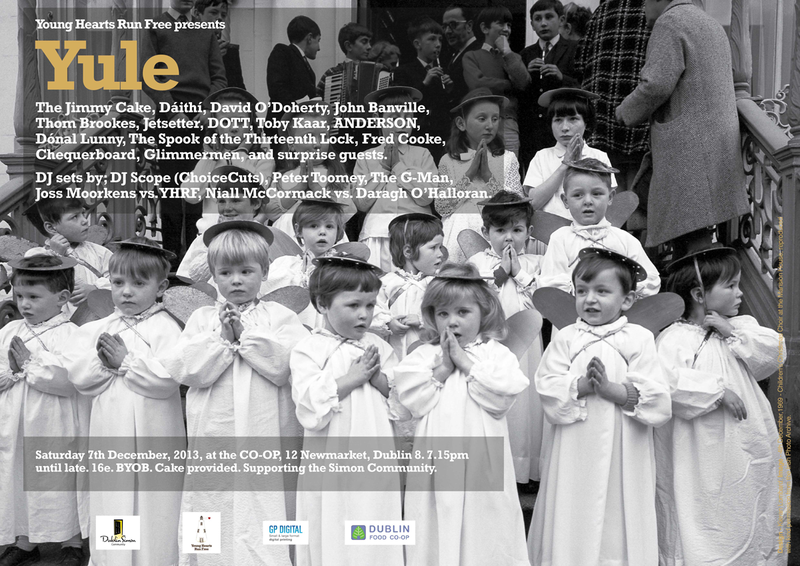 It will all take place in the CO-OP, 12 Newmarket, Dublin 8. It is BYOB, 16e in, cake will be provided, and all proceeds as ever, to the Simon Community. Please come, and we will endeavour to make it our best Yule yet….